The availability of cotton seeds and the risk of contamination are major challenges to sustainable cotton growing. Non-GMO seeds for certified organic and Fairtrade farmers is not only scarce but often much more expensive too. Moreover, purchased seeds need to be tested regularly to check that they have not become contaminated. The risk of contamination also makes it more difficult for farmers to produce seeds themselves on an individual basis. As a result, the Natural Fibres Working Group and the Implementation and Internationalisation Working Group developed the Partnership Initiative entitled ‘Empowering small holding farmers and improving quality and supply of non-genetically modified cotton from Central Asia’, which the Steering Committee adopted as the fourth Partnership Initiative. Building on the existing expertise and structures in farmers’ cooperatives, the aim is to develop capacities so as to be able to multiply non-GMO cotton seeds. Smallholders are to be strengthened and sustainable supply relationships developed. Other measures include the setting-up and training of a ‘Seed Task Force’ and competence centres, the provision of funding for technical equipment and GMO testing, as well as awareness-raising and information measures on how to prevent seed contamination. Although the Initiative is initially focusing on Central Asia, plans are also in place to expand it to another country. Improvement in social standards at spinning plants in India: The Initiative was launched on 19 September 2017 with a workshop held in Coimbatore, attended by representatives of the state government, civil society and local businesses. 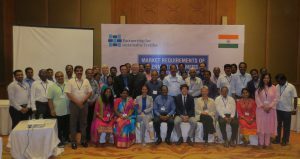 The delegation from the Textiles Partnership, comprising representatives of the Federal Ministry for Economic Cooperation and Development (BMZ), Tchibo, Hugo Boss, Fairtrade, FEMNET and the Partnership Secretariat held a series of talks in Chennai, including with high-ranking government representatives. Environmental and chemicals management in Bangladesh and China: To date, training materials have been compiled, translated into the required languages and tested during an initial pilot training course held in Myanmar in August in cooperation with sequa gGmbH. In September, an initial stakeholder meeting took place in Bangladesh, discussions were held with representatives of the chemical industry at Tchibo in Hamburg, and the University of Stuttgart hosted a colloquium on academic exchange. Improvement of water management for a sustainable supply in the cotton sector in Pakistan: A work plan has been finalised together with partners in Lahore. Contractual negotiations are currently underway. More companies are being urgently sought to support the Initiative. The implementation agreements between the stakeholders for the three Partnership Initiatives already in place are in the process of being harmonised. This will complete the joint strategy development phase, and the contributions – either financial or in-kind – to be made by the parties will be clearly stated. The Textiles Partnership is dependent on the voluntary participation of a sufficient number of members. In order to improve the mainstreaming of the Partnership goals in the delivery chain, raise the profile of the Textiles Partnership in production countries and support the implementation of Partnership Initiatives, the Steering Committee approved a model aimed at involving national actors in the production countries. In the production countries, national actors that are actively involved in the Partnership Initiatives will in future be designated as ‘textile partners’. To promote the international networking of the Textiles Partnership in the area of chemicals management, the Steering Committee decided that the Textiles Partnership will join the Chemicals in Products Programme (CiP) under the Strategic Approach to International Chemicals Management (SAICM). SAICM is a multi-stakeholder and multi-sectoral, voluntary strategy under the aegis of the United Nations Environment Programme. Its goal is to minimise the adverse effects of chemicals on human health and the environment by 2020.